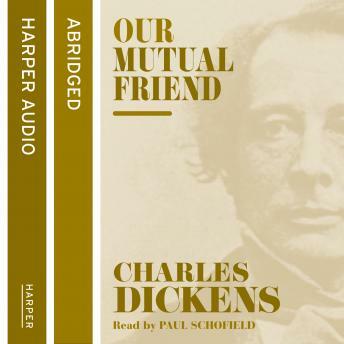 'Our Mutual Friend', Dickens' last complete novel, gives one of his most comprehensive and penetrating accounts of Victorian society. Its vision of a culture stifled by materialistic values emerges not just through its central narratives, but through its apparently incidental characters and scenes. 'Our Mutual Friend', Dickens' last complete novel, gives one of his most comprehensive and penetrating accounts of Victorian society. Its vision of a culture stifled by materialistic values emerges not just through its central narratives, but through its apparently incidental characters and scenes. The chief of its several plots centres on John Harmon who returns to England as his father's heir. He is believed drowned under suspicious circumstances - a situation convenient to his wish for anonymity until he can evaluate Bella Wilfer whom he must marry to secure his inheritance. The story is filled with colourful characters and incidents - the faded aristocrats and parvenus gathered at the Veneering's dinner table, Betty Higden and her terror of the workhouse and the greedy plottings of Silas Wegg.